It was a busy day at the State Capitol as the governor proposes his budget and transgender New Yorkers gain some rights. WXXI's Karen DeWitt has more. The New York State Legislature for the first time granted civil rights to transgender New Yorkers. And on a busy day at the State Capitol, Gov. Andrew Cuomo also released his $175 billion budget plan. Senate sponsor Brad Hoylman got a bit emotional on the Senate floor when he spoke about the provisions of a measure that will add “gender identity” and “gender expression” as a protected class in the state’s human rights laws, outlawing discrimination in employment and housing. The bill also adds gender identity to the categories protected in the state’s hate crimes law, adding additional penalties if a crime against a transgender person is determined to be bias-motivated. Hoylman said transgender New Yorkers who offered comments on the senator’s website said they’ve been turned down for medical exams and denied service at restaurants, and have even had issues with using public bathrooms. Teri Wilhelm, a transgender woman, works on behalf of gay, lesbian and transgender teenagers in the state’s school systems. She said the new law brings her tremendous relief since she now has a tool to fight the discrimination she fears in her daily life. “Just fear of going to the grocery store, sometimes, that’s a little bit too much,” Wilhelm said. Wilhelm said she received her teaching certificate in 2008, but has been turned down for every teaching job she’s ever applied for. “You might get interviewed, but you’ll never get past (that point),” she said. The measure passed, 42-19, with all of the negative votes coming from Republicans. No GOP senators spoke on the floor. The Legislature also moved to ban conversion therapy, where gay, lesbian and transgendered people undergo treatments designed to talk them out of their sexual or gender identification. It also was approved in the state Assembly and now awaits the governor’s signature. The Legislature planned to vote on the historic legislation before Cuomo announced that he would present his budget address two weeks early. Cuomo, in a theater in the State Capitol complex, offered more details of his plan to legalize recreational marijuana for adults aged 21 years and over. And Cuomo said he’ll look at directing some of the estimated $300 million in revenues imposed on the production, distribution and sale of the drug to communities that have been harmed by the decades-long prohibition of cannabis. 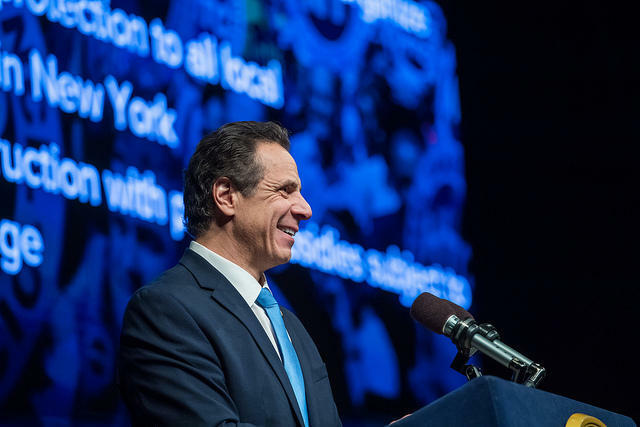 “Let’s create an industry that empowers the poor communities that paid the price and not the rich corporations who come in to make a profit,” Cuomo said. Counties and local government would be able to prohibit marijuana retail stores if they want. Cuomo is setting up a potential fight over school aid. He is proposing a $1 billion increase in school aid — about half of what is recommended by the State Board of Regents — and he wants to revamp the school aid formula. The governor said funding inequality is not about a lack of aid given to the state’s poorest districts. He said the districts themselves are not distributing the money properly. “The additional need has to go to the poorer school and the poorer student,” Cuomo said. Regents Chancellor Betty Rosa and state Education Commissioner Mary Ellen Elia, in a joint statement, said they are “extremely alarmed” with the governor’s proposal to include just $338 million in Foundation Aid, which is directed toward the state’s neediest schools. Democratic lawmakers, including Assembly Speaker Carl Heastie, were positive about the governor’s overall budget message, but said they will work to increase school aid in the final budget. Senate Deputy Minority Leader Joe Griffo, a Republican who also supports more money for schools, said it seems like Cuomo is blaming the school districts for problems created by the state. Cuomo said the state faces a $3 billion budget gap, which he blames on decreased tax collections due to federal changes to the tax code. The governor also wants to ban plastic shopping bags and institute congestion pricing below 60th Street in Manhattan to help fund public transit.